Exhaust Stud Kit - 3/8-16 x 2-1/2 In. 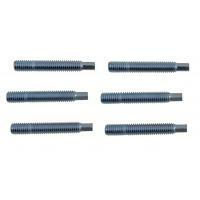 Product Description - Long - 80: Exhaust Stud Kit - 3/8-16 x 2-1/2 In. This part generally fits Buick, Cadillac, Chevrolet, GMC, Oldsmobile, Pontiac vehicles and includes models such as Apollo, Astro, Bel Air, Biscayne, Blazer, Bonneville, Brookwood, C10, C10 Pickup, C10 Suburban, C15, C15 Suburban, C15/C1500 Pickup, C15/C1500 Suburban, C1500, C1500 Suburban, C20, C20 Pickup, C20 Suburban, C25, C25 Suburban, C25/C2500 Pickup, C25/C2500 Suburban, C2500, C2500 Suburban, C30, C30 Pickup, C35, C35/C3500 Pickup, C3500, Caballero, Calais, Camaro, Caprice, Catalina, Century, Chevelle, Chevy II, Commercial Chassis, Corvette, DeVille, El Camino, Eldorado, Estate Wagon, Executive, Express 2500, F85, Firebird, Fleetwood, G10, G10 Van, G15, G15/G1500 Van, G1500, G20, G20 Van, G25, G25/G2500 Van, G2500, G30, G30 Van, G35, G35/G3500 Van, G3500, Gran Sport, Grand Am, Grand LeMans, Grand Prix, Grand Safari, Grandville, GTO, Impala, Jimmy, K10, K10 Pickup, K10 Suburban, K15, K15 Suburban, K15/K1500 Pickup, K15/K1500 Suburban, K1500, K1500 Suburban, K20, K20 Pickup, K20 Suburban, K25, K25 Suburban, K25/K2500 Pickup, K25/K2500 Suburban, K2500, K2500 Suburban, K30, K30 Pickup, K35, K35/K3500 Pickup, K3500, K5 Blazer, Kingswood, Laguna, LeMans, LeSabre, Malibu, Monte Carlo, Monza, Nova, Omega, P10, P10 Van, P15, P15/P1500 Van, P1500, P20, P20 Van, P25, P25/P2500 Van, P2500, P30, P30 Van, P35, P35/P3500 Van, P3500, P40, P4500, Parisienne, R20, R2500, R30, R3500, Regal, Safari, Savana 2500, Seville, Skyhawk, Skylark, Special, Sportwagon, Sprint, Starfire, Tempest, Townsman, V20, V2500, V30, V3500, Ventura with the trims of 2+2 Hatchback 2-Door, 2+2 Sport Hatchback 2-Door, 2+2 Spyder Hatchback 2-Door, 300, 300 Coupe 2-Door, 300 Deluxe, 300 Deluxe Coupe 2-Door, 300 Deluxe Hardtop 2-Door, 300 Deluxe Sedan 2-Door, 300 Deluxe Sedan 4-Door, 300 Deluxe Wagon 4-Door, 300 Sedan 2-Door, 300 Sedan 4-Door, 300 Wagon 4-Door, 350, 350 HO, 400, 60 Special Brougham Sedan 4-Door, 75 Formal Limousine 4-Door, 75 Limousine 4-Door, 75 Sedan 4-Door, Amarillo Standard Cab Pickup 2-Door, Base, Base Cab & Chassis 2-Door, Base Cab & Chassis 4-Door, Base Convertible 2-Door, Base Coupe 2-Door, Base Crew Cab Pickup 4-Door, Base Extended Cab Pickup 2-Door, Base Extended Cargo Van 3-Door, Base Extended Passenger Van 3-Door, Base Hardtop 2-Door, Base Hardtop 4-Door, Base Hatchback 2-Door, Base Hearse 2-Door, Base Limousine 4-Door, Base Sedan 2-Door, Base Sedan 4-Door, Base Sport Utility 2-Door, Base Sport Utility 3-Door, Base Sport Utility 4-Door, Base Standard Cab Pickup 2-Door, Base Standard Cargo Van 2-Door, Base Standard Cargo Van 3-Door, Base Standard Passenger Van 2-Door, Base Standard Passenger Van 3-Door, Base Stripped Chassis, Base Wagon 2-Door, Base Wagon 4-Door, Beauville Extended Passenger Van 3-Door, Beauville Standard Passenger Van 3-Door, Berlinetta Coupe 2-Door, Biarritz Coupe 2-Door, Bicentenial Edition Convertible 2-Door, Big Ten Standard Cab Pickup 2-Door, Bonaventure Extended Passenger Van 3-Door, Bonaventure Standard Passenger Van 3-Door, Brougham, Brougham Coupe 2-Door, Brougham d'Elegance Coupe 2-Door, Brougham d'Elegance Sedan 4-Door, Brougham Hardtop 2-Door, Brougham Hardtop 4-Door, Brougham Sedan 4-Door, Brougham Talisman Sedan 4-Door, Brougham Wagon 4-Door, Cabriolet Coupe 2-Door, Chevy Van Cutaway Van 2-Door, Chevy Van Extended Cargo Van 3-Door, Chevy Van Standard Cargo Van 3-Door, Cheyenne Cab & Chassis 2-Door, Cheyenne Cab & Chassis 4-Door, Cheyenne Crew Cab Pickup 4-Door, Cheyenne Sport Utility 2-Door, Cheyenne Standard Cab Pickup 2-Door, CL Coupe 2-Door, CL Extended Passenger Van 3-Door, CL Standard Passenger Van 3-Door, Classic, Classic Brougham Sedan 4-Door, Classic Convertible 2-Door, Classic Coupe 2-Door, Classic Estate Wagon 4-Door, Classic Hardtop 2-Door, Classic Landau Coupe 2-Door, Classic Landau Sedan 4-Door, Classic LS Brougham Sedan 4-Door, Classic Sedan 4-Door, Classic Sport Coupe 2-Door, Classic Sport Sedan 4-Door, Classic Standard Cab Pickup 2-Door, Classic Wagon 4-Door, Concours, Concours Coupe 2-Door, Concours Estate, Concours Estate Wagon 4-Door, Concours Hardtop 4-Door, Concours Hatchback 2-Door, Concours Sedan 4-Door, Concours Wagon 4-Door, Conquista Standard Cab Pickup 2-Door, CS Extended Passenger Van 3-Door, CS Standard Passenger Van 3-Door, Custom, Custom Cab & Chassis 2-Door, Custom Cab & Chassis 4-Door, Custom Convertible 2-Door, Custom Coupe 2-Door, Custom Crew Cab Pickup 4-Door, Custom Deluxe Cab & Chassis 2-Door, Custom Deluxe Cab & Chassis 4-Door, Custom Deluxe Crew Cab Pickup 4-Door, Custom Deluxe Sport Utility 2-Door, Custom Deluxe Sport Utility 4-Door, Custom Deluxe Standard Cab Pickup 2-Door, Custom Hardtop 2-Door, Custom Hardtop 4-Door, Custom Hatchback 2-Door, Custom Landau Coupe 2-Door, Custom Sedan 2-Door, Custom Sedan 4-Door, Custom Sport Coupe 2-Door, Custom Sport Utility 2-Door, Custom Sport Utility 4-Door, Custom Standard Cab Pickup 2-Door, Custom Wagon 4-Door, d'Elegance Coupe 2-Door, d'Elegance Sedan 4-Door, Deluxe, Deluxe Cab & Chassis 2-Door, Deluxe Cab & Chassis 4-Door, Deluxe Coupe 2-Door, Deluxe Crew Cab Pickup 4-Door, Deluxe Hardtop 2-Door, Deluxe Sedan 4-Door, Deluxe Sport Utility 2-Door, Deluxe Sport Utility 4-Door, Deluxe Standard Cab Pickup 2-Door, Deluxe Wagon 4-Door, Designers' Accent Edition Hatchback 2-Door, Diablo Standard Cab Pickup 2-Door, Elegante Sedan 4-Door, Esprit, Esprit Coupe 2-Door, Estate, Estate Wagon 4-Door, Estate Wagon Wagon 4-Door, Firenza Hatchback 2-Door, Formal Limousine 4-Door, Formula, Formula Coupe 2-Door, Greenbrier, Greenbrier Wagon 4-Door, GT Extended Passenger Van 3-Door, GT Hatchback 2-Door, GTO, GTO Coupe 2-Door, Heavy Half Cab & Chassis 2-Door, Heavy Half Standard Cab Pickup 2-Door, Hi-Cube Cutaway Van 2-Door, High Sierra Cab & Chassis 2-Door, High Sierra Cab & Chassis 4-Door, High Sierra Crew Cab Pickup 4-Door, High Sierra Extended Cab Pickup 2-Door, High Sierra Sport Utility 2-Door, High Sierra Sport Utility 4-Door, High Sierra Standard Cab Pickup 2-Door, HO, Indianapolis 500 Pace Car Coupe 2-Door, Indy Hauler Standard Cab Pickup 2-Door, Landau, Landau Coupe 2-Door, Landau Sedan 4-Door, Laredo Standard Cab Pickup 2-Door, LE Coupe 2-Door, LE Sedan 4-Door, Limited Coupe 2-Door, Limited Sedan 4-Door, LJ Coupe 2-Door, LN Coupe 2-Door, LN Sedan 4-Door, LS Coupe 2-Door, LS Extended Passenger Van 3-Door, LS Standard Passenger Van 3-Door, LT Coupe 2-Door, LT Extended Passenger Van 3-Door, LT Rally Sport Coupe 2-Door, LT Standard Passenger Van 3-Door, Luxury, Magnavan Cutaway Van 2-Door, Malibu, Malibu Convertible 2-Door, Malibu Hardtop 2-Door, Malibu Hardtop 4-Door, Malibu Sedan 4-Door, Malibu Wagon 4-Door, Mirage Hatchback 2-Door, Motor Home, Nomad Extended Passenger Van 3-Door, Nomad Wagon 4-Door, Nova, Nova Convertible 2-Door, Nova Hardtop 2-Door, Nova Sedan 2-Door, Nova Sedan 4-Door, Nova SS, Nova Wagon 4-Door, Opera Coupe 2-Door, P4T042 Straight Truck - Cab Forward, P4T042 Stripped Chassis - Cab Forward, Phaeton Coupe 2-Door, Phaeton Sedan 4-Door, Police Sedan 4-Door, Rally, Rally Camper Special Cutaway Van 2-Door, Rally Coupe 2-Door, Rally Custom Extended Passenger Van 3-Door, Rally Custom Standard Passenger Van 3-Door, Rally Extended Passenger Van 3-Door, Rally Hatchback 2-Door, Rally Sport Coupe 2-Door, Rally Standard Passenger Van 2-Door, Rally Standard Passenger Van 3-Door, Rally STX Extended Passenger Van 3-Door, Rally STX Standard Passenger Van 3-Door, Road Hawk Hatchback 2-Door, Royal Knight Standard Cab Pickup 2-Door, RS Convertible 2-Door, RS Coupe 2-Door, RS Hardtop 2-Door, S, S Coupe 2-Door, S Hatchback 2-Door, S Sedan 2-Door, S Sedan 4-Door, S3 Coupe 2-Door, Safari, Safari Wagon 4-Door, Scottsdale Cab & Chassis 2-Door, Scottsdale Cab & Chassis 4-Door, Scottsdale Crew Cab Pickup 4-Door, Scottsdale Sport Utility 2-Door, Scottsdale Sport Utility 4-Door, Scottsdale Standard Cab Pickup 2-Door, Sierra Classic Cab & Chassis 2-Door, Sierra Classic Cab & Chassis 4-Door, Sierra Classic Crew Cab Pickup 4-Door, Sierra Classic Extended Cab Pickup 2-Door, Sierra Classic Sport Utility 2-Door, Sierra Classic Sport Utility 4-Door, Sierra Classic Standard Cab Pickup 2-Door, Sierra Grande Cab & Chassis 2-Door, Sierra Grande Cab & Chassis 4-Door, Sierra Grande Crew Cab Pickup 4-Door, Sierra Grande Sport Utility 2-Door, Sierra Grande Sport Utility 4-Door, Sierra Grande Standard Cab Pickup 2-Door, Sierra Madre Del Sur Standard Cab Pickup 2-Door, Silver Anniversary Edition Coupe 2-Door, Silverado Cab & Chassis 2-Door, Silverado Cab & Chassis 4-Door, Silverado Crew Cab Pickup 4-Door, Silverado Sport Utility 2-Door, Silverado Sport Utility 4-Door, Silverado Standard Cab Pickup 2-Door, SJ Coupe 2-Door, SJ Hatchback 2-Door, SJ Sedan 2-Door, SJ Sedan 4-Door, SL Extended Cargo Van 3-Door, SL Extended Passenger Van 3-Door, SL Standard Cargo Van 3-Door, SL Standard Passenger Van 3-Door, SLE Extended Passenger Van 3-Door, SLE Standard Passenger Van 3-Door, SLT Extended Passenger Van 3-Door, SLT Standard Passenger Van 3-Door, SLX Extended Passenger Van 3-Door, SLX Standard Passenger Van 3-Door, SP Standard Cab Pickup 2-Door, Special Coupe 2-Door, Special Sedan 4-Door, Special Wagon 4-Door, Sport, Sport Coupe 2-Door, Sport Sedan 4-Door, Sport Standard Cab Pickup 2-Door, Sportvan, Sportvan Extended Passenger Van 3-Door, Sportvan Standard Passenger Van 2-Door, Sportvan Standard Passenger Van 3-Door, Spyder Coupe 2-Door, Spyder Hatchback 2-Door, SR Coupe 2-Door, SR Hatchback 2-Door, SR Sedan 4-Door, SS, SS Convertible 2-Door, SS Coupe 2-Door, SS Hardtop 2-Door, SS Hatchback 2-Door, SS Standard Cab Pickup 2-Door, Step-Van Standard Cargo Van 2-Door, Stingray Convertible 2-Door, Stingray Coupe 2-Door, Street Coupe Sport Utility 2-Door, Street Coupe Standard Cab Pickup 2-Door, SX Hatchback 2-Door, T37, The Judge, Touring Coupe 2-Door, Towne Coupe Cabriolet Coupe 2-Door, Towne Coupe Coupe 2-Door, Towne Coupe Sport Coupe 2-Door, Trans Am, Trans Am Coupe 2-Door, Trans Am Hardtop 2-Door, Type S-3, Value Van Standard Cargo Van 2-Door, Vandura , Vandura Extended Cargo Van 3-Door, Vandura Special Cutaway Van 2-Door, Vandura Standard Cargo Van 2-Door, Vandura Standard Cargo Van 3-Door, Ventura, Z28 Coupe 2-Door . The engine types may include 3.2L 194Cu. In. l6 GAS Naturally Aspirated, 3.2L 196Cu. In. V6 GAS OHV Naturally Aspirated, 3.2L 3180CC 194Cu. In. l6 GAS OHV Naturally Aspirated, 3.3L 200Cu. In. V6 GAS OHV Naturally Aspirated, 3.7L 225Cu. In. V6 GAS Naturally Aspirated, 3.7L 3687CC 225Cu. In. V6 GAS OHV Naturally Aspirated, 3.8L 229Cu. In. V6 GAS OHV Naturally Aspirated, 3.8L 230Cu. In. l6 GAS Naturally Aspirated, 3.8L 231Cu. In. V6 GAS Naturally Aspirated, 3.8L 231Cu. In. V6 GAS OHV Naturally Aspirated, 3.8L 3769CC 230Cu. In. l6 GAS OHV Naturally Aspirated, 3.8L 3800CC 231Cu. In. V6 GAS OHV Naturally Aspirated, 3.8L 3800CC 231Cu. In. V6 GAS OHV Turbocharged, 3.9L 239Cu. In. l4 DIESEL OHV Turbocharged, 4.1L 250Cu. In. l6 GAS Naturally Aspirated, 4.1L 250Cu. In. l6 GAS OHV Naturally Aspirated, 4.1L 250Cu. In. V8 GAS OHV Naturally Aspirated, 4.1L 252Cu. In. V6 GAS OHV Naturally Aspirated, 4.1L 4097CC 250Cu. In. l6 GAS OHV Naturally Aspirated, 4.1L 4097CC 250Cu. In. l6 GAS SOHC Naturally Aspirated, 4.1L 4097CC 250Cu. In. l6 LPG OHV Naturally Aspirated, 4.1L 4098CC 250Cu. In. l6 GAS OHV Naturally Aspirated, 4.3L 262Cu. In. V6 GAS OHV Naturally Aspirated, 4.3L 262Cu. In. V8 GAS OHV Naturally Aspirated, 4.3L 265Cu. In. V8 GAS OHV Naturally Aspirated, 4.4L 267Cu. In. V8 GAS Naturally Aspirated, 4.4L 267Cu. In. V8 GAS OHV Naturally Aspirated, 4.6L 283Cu. In. V8 GAS Naturally Aspirated, 4.6L 4638CC 283Cu. In. V8 GAS OHV Naturally Aspirated, 4.8L 292Cu. In. l6 GAS Naturally Aspirated, 4.8L 292Cu. In. l6 GAS OHV Naturally Aspirated, 4.8L 292Cu. In. l6 LPG Naturally Aspirated, 4.8L 4786CC 292Cu. In. l6 GAS OHV Naturally Aspirated, 4.8L 4801CC 292Cu. In. l6 GAS OHV Naturally Aspirated, 4.8L 4801CC 292Cu. In. l6 LPG OHV Naturally Aspirated, 4.9L 300Cu. In. V8 GAS Naturally Aspirated, 4.9L 301Cu. In. V8 GAS OHV Naturally Aspirated, 4.9L 301Cu. In. V8 GAS OHV Turbocharged, 4.9L 4917CC 300Cu. In. V8 GAS OHV Naturally Aspirated, 5.0L 305Cu. In. V8 GAS OHV Naturally Aspirated, 5.0L 307Cu. In. V8 GAS Naturally Aspirated, 5.0L 307Cu. In. V8 GAS OHV Naturally Aspirated, 5.0L 5031CC 307Cu. In. V8 GAS OHV Naturally Aspirated, 5.4L 327Cu. In. V8 GAS Naturally Aspirated, 5.6L 340Cu. In. V8 GAS Naturally Aspirated, 5.6L 5573CC 340Cu. In. V8 GAS OHV Naturally Aspirated, 5.7L 350Cu. In. V8 CNG OHV Naturally Aspirated, 5.7L 350Cu. In. V8 DIESEL OHV Naturally Aspirated, 5.7L 350Cu. In. V8 GAS Naturally Aspirated, 5.7L 350Cu. In. V8 GAS OHV Naturally Aspirated, 5.7L 350Cu. In. V8 LPG Naturally Aspirated, 5.7L 5733CC 350Cu. In. V8 GAS OHV Naturally Aspirated, 5.7L 5735CC 350Cu. In. V8 GAS OHV Naturally Aspirated, 5.7L 5736CC 350Cu. In. V8 GAS OHV Naturally Aspirated, 5.7L 5736CC 350Cu. In. V8 LPG OHV Naturally Aspirated, 5.7L 5737CC 350Cu. In. V8 GAS OHV Naturally Aspirated, 6.0L 368Cu. In. V8 GAS OHV Naturally Aspirated, 6.2L 379Cu. In. V8 DIESEL OHV Naturally Aspirated, 6.5L 396Cu. In. V8 GAS Naturally Aspirated, 6.5L 6489CC 396Cu. In. V8 GAS OHV Naturally Aspirated, 6.6L 400Cu. In. V8 GAS Naturally Aspirated, 6.6L 400Cu. In. V8 GAS OHV Naturally Aspirated, 6.6L 402Cu. In. V8 GAS Naturally Aspirated, 6.6L 402Cu. In. V8 GAS OHV Naturally Aspirated, 6.6L 403Cu. In. V8 GAS OHV Naturally Aspirated, 6.6L 6555CC 400Cu. In. V8 GAS OHV Naturally Aspirated, 6.6L 6556CC 400Cu. In. V8 GAS OHV Naturally Aspirated, 6.6L 6588CC 402Cu. In. V8 GAS OHV Naturally Aspirated, 6.7L 409Cu. In. V8 GAS Naturally Aspirated, 6.7L 6704CC 409Cu. In. V8 GAS OHV Naturally Aspirated, 7.0L 425Cu. In. V8 GAS OHV Naturally Aspirated, 7.0L 427Cu. In. V8 GAS Naturally Aspirated, 7.0L 428Cu. In. V8 GAS Naturally Aspirated, 7.0L 6998CC 427Cu. In. V8 GAS OHV Naturally Aspirated, 7.0L 7014CC 428Cu. In. V8 GAS OHV Naturally Aspirated, 7.4L 454Cu. In. V8 GAS Naturally Aspirated, 7.4L 454Cu. In. V8 GAS OHV Naturally Aspirated, 7.4L 7439CC 454Cu. In. V8 GAS OHV Naturally Aspirated, 7.4L 7441CC 454Cu. In. V8 GAS OHV Naturally Aspirated, 7.5L 455Cu. In. V8 GAS Naturally Aspirated, 7.5L 455Cu. In. V8 GAS OHV Naturally Aspirated, 7.5L 7456CC 455Cu. In. V8 GAS OHV Naturally Aspirated, 7.5L 7457CC 455Cu. In. V8 GAS OHV Naturally Aspirated, 8.2L 500Cu. In. V8 GAS OHV Naturally Aspirated. This part fits vehicles made in the following years 1962, 1963, 1964, 1965, 1966, 1967, 1968, 1969, 1970, 1971, 1972, 1973, 1974, 1975, 1976, 1977, 1978, 1979, 1980, 1981, 1982, 1983, 1984, 1985, 1986, 1987, 1988, 1989, 1990, 1991, 1992, 1993, 1994, 1995, 1996, 1997, 1998, 1999, 2000, 2001, 2002, 2003, 2004, 2005. This item may interchange to the following part numbers from other brands. This is provided for reference only and does not guarantee that the part your are buying is identical to the part numbers from the brands listed below. To confirm that this part fits your vehicle, enter your vehicle's Year, Make, Model, Trim and Engine in the Compatibility Table.